Good morning everyone! I hope you are all having a fabulous Saturday. 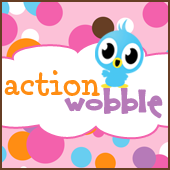 Today I want to share with you another fun card I made as a member of the Action Wobble Design Team! This card is extra fun as it includes an Action Wobble under the fish. You can make it look like the fish is swimming. "It is of-FISH-ial, you are loved"
Very cute. I love your adorable fish card. The hearts for bubbles are such a nice touch.